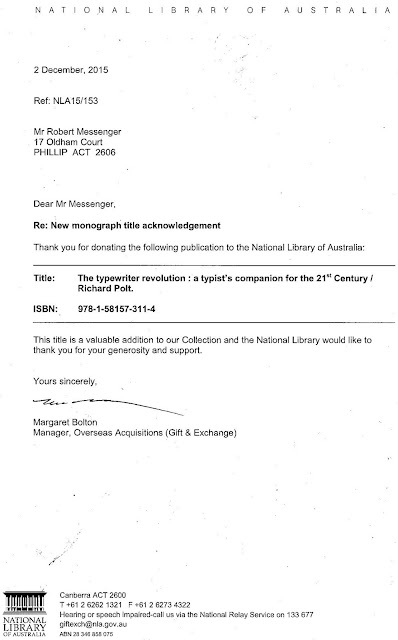 I called into the National Library in Canberra this morning to do some typewriter research and, lo and behold, there was Richard Polt's The Typewriter Revolution prominently displayed in the "new on the shelf" section in the main reading room, two shelves higher than Richie Benaud! I'd only received an acknowledgement of its donation a week earlier. Great news for Richard's book. I think "nationally available for reading" would be more accurate than Ted's "nationally read"! But I am sincerely grateful, Robert, and it brings me a smile to see it displayed there.